Higgins Pigmented Drawing Ink 1ozHiggins Drawing Inks are vivid, opaque, translucent colors for technical pens, dip pens, brushes, and airbrushes. The colors can be diluted and blended. All 9 colors can be intermixed and diluted with water to produce an infinite range of colors. These inks are extremely light-fast, fade-proof, and perform like watercolor with beautiful color concentration and movement. Higgens Drawing Ink dries with a semi-gloss sheen. 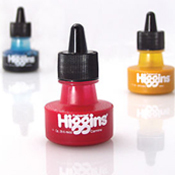 Higgins Drawing Inks are vivid, opaque, translucent colors for technical pens, dip pens, brushes, and airbrushes. The colors can be diluted and blended. All 9 colors can be intermixed and diluted with water to produce an infinite range of colors. These inks are extremely light-fast, fade-proof, and perform like watercolor with beautiful color concentration and movement. Higgens Drawing Ink dries with a semi-gloss sheen. 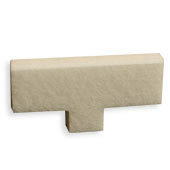 This product was added to our catalog on Wednesday May 17, 2017.